Past and present ALPCA Chesapeake Region newsletters in .pdf format are available for online viewing, downloading, and printing, for personal use only. 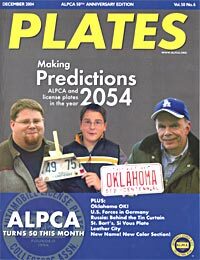 ALPCA, our parent organization, puts out a wonderful bi-monthly publication called Plates. If you're an ALPCA member, you'll get a copy of this glossy, full-color magazine delivered to your mailbox every two months. © Copyright 2010-2017 by Automobile License Plate Collectors' Association, Inc. (Chesapeake Region). All rights reserved. Plate images used with permission.